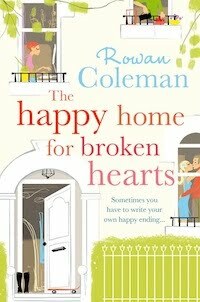 Imagine logging on to Facebook to discover UK author Rowan Coleman asking for volunteers to review her latest book The Happy Home for Broken Hearts. I jumped at the chance, and a few weeks later, I received a copy in the mail. Rowan Coleman is the bestselling author of The Accidental Mother, The Accidental Wife and The Baby Group. She has also written the YA Ruby Parker series. In total, she has written 8 books, the first of which was published in 2002. It's a wonder that she has had time to breathe since then. In addition, she runs short story contests on her blog with fabulous prizes. Read the latest eight winners here. She also holds a flash fiction contest on her Facebook page every Friday, and they're a lot of fun. We meet Ellen Woods (or Ellie as she is known to most) at the passing of her husband Nick, who was killed suddenly in a tragic car accident. Grief stricken, Ellen spends the next year living vicariously through the romance novels she edits in her Victorian house with her adolescent son Charlie. Not only does Ellen have to come to grips with being widowed, but she also has to face the fact that her dearly beloved left her penniless. Sister Hanna aggressively convinces Ellen to open her home to lodgers to stave off bankruptcy. There's an interesting and realistic dynamic created between Ellen and her sister Hanna. Born in the early 70s, Ellie chooses the more traditional route in life, marrying and abandoning her professional aspirations, while sister Hannah born 8 years later opts for the single, professional and sexually-liberated path. Both predictably assume that the other has made the better choice. As Ellen realizes that she still has her entire life ahead of her and must break out of her self-imposed confinement, Hannah begins her downward, self-destructive spiral, as the truth she is hiding becomes too much to bear. Although the reader initially fears the neediness of prima donna Allegra, it's the wisdom and insight that Allegra brings to Ellen's life that gives her the momentum to move forward. The aspiring novelist will also glean a few gems from Allegra and Ellen's professional relationship. The reader gets better acquainted with all the characters on the home's centre stage, the kitchen, also the site of a few cringingly awkward, yet liberating encounters. Perhaps the most beautifully rendered relationship in the book is the one between Ellen and her son Charlie, who is still grieving the loss of his father and coping with adolescence. His new found independence is another change that Ellen, and every other mother on earth, struggles to comes to terms with. If Hannah, Allegra and Matt are instrumental in making Ellen break out of her protective shell, then Charlie is the force that keeps Ellen from skidding out of control. This was a great way to escape a rainy weekend, and I look forward to the sequel, which I'm sure RC is penning as we speak. As usual, I will be giving this book away to a new follower. Just follow my blog via google. Winner to be announced on September 19.
: Review: The Happy Home for Broken HeartsTweet this!